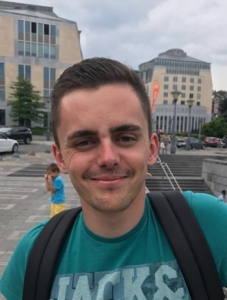 Clément Kotras obtained a Master degree in Chemistry (Applied Synthesis, Separation, and Analysis) from the Université de Montpellier (France) in 2016. His Master thesis was about the optimization of the synthesis of sugar-phosphate derivative. In 2016, he started a joint PhD between the Laboratory for Chemistry of Novel Materials at UMons and the laboratory of Chimie Macromoléculaire et Organisation du Solide at UMontpellier, under the supervision of Pr. Mathieu Surin and Pr. Sébastien Clément. His PhD research topic deals with π-conjugated materials for applications in health, through the design and spectroscopic characterization of small molecular probes and dynamic polymers that bind DNA.